Today, if you ask a conventional optics supplier to make an LED lighting optic to your custom need, you will be presented with a daunting minimum order quantity and an up-front cost of tens of thousands of Euros. Your supplier has to cover the costs to produce a mold, and set up their expensive equipment for a long enough production run to warrant the investment. Doing that for one single optical prototype or limited series would be prohibitively expensive. It is true that if you finally start producing thousands of optics at the end, each optic will be much inexpensive, due to ‘economies of scale’. However, the business imperative to achieve such economies of scale has fundamentally distorted the economics of the lighting industry, severely constraining the number of new products that can be introduced, and making it hard to stay abreast of changes in technologies, availability of supply or trends in market demand. Thanks to the invention of Printoptical Technology – 100% digitally run by CAD-driven software – for an additively manufactured LED lighting optic economies of scale don’t matter anymore. This will be a huge advantage for lighting entrepreneurs who are, due to their limited availability of cash, not able to introduce new designs without the cost of a facility or distant manufacturing firm. A significant part of – sometimes very brilliant – product ideas remains unexploited in the desk archive. Thanks to the wide use of 3D-CAD and lighting design software from providers, like Autodesk, Solid Works, Photopia and LightTools, designs can be created easily, endlessly tweaked and converted easily at low cost. The cost of setting up the ‘Printoptical Printing Platform’ is the same whether it makes one thing or as many production lots as can fit inside the machine. Like a printing press that pushes out one or many different print brochures, the machine keep going until the ‘ink cartridge’ – a container with a liquid Polymer – is empty, and the ‘paper’ – raw translucent substrate materials like PMMA and Polycarbonates – needs to be replenished. Many optics engineers and designers work in the so called ‘long tail’, developing specialty optics, new designs, and lower-volume deployments. The long tail applications rarely have the sales volumes to justify large up-front investments in time or the resources to develop a “full” LED optic. This may be because these are new applications in the initial conception and research stages of a lighting product, or because they are new variations on an existing concept. 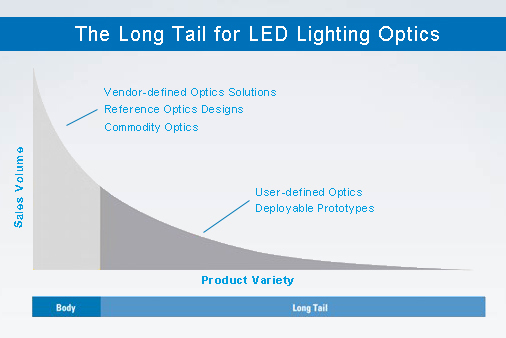 The Long Tail Effect for LED Optics: lower investment cost, increased flexibility and a greater product variety. Printoptical Technology will allow lighting optics to be produced in one step from a digital CAD file due to the new, revolutionary 3D printing process. Optics can be made economically in much smaller numbers, more flexibly and with a much lower input of labor, thanks to the use of new materials, processes, and on-demand CAD-based custom manufacturing services. Production is moving away from ‘mass manufacturing’ to ‘mass customization’ and back towards much more individualized production. Customers get a broader array of choices and solutions better fitted to their needs, and manufacturers earn the loyalty and higher profit margins that come with better satisfying individual customer demands and preferences. This article is the second publication within a range of four articles written on the Additive Manufacturing of LED lighting optics. The next edition – to appear in the next couple of weeks – will explain the benefits for its adopters on design, time-to-market and competition in more detail.